When taking about laptops, we first look at its specifications. People never consider user experience which is possibly the most important factor for any mobile device. If you are building a PC then this isn’t the case. Your setup’s ergonomics is independent of your internal components. This is not the case with laptops, even with all the i5s and i7s, working on them can still be inconvenient. The displays can have back light bleed or typing on them may make your fingers and wrists hurt. One cannot help but think of Apple’s MacBook, when user-friendliness is at stake. The $800 price tag is, sadly, difficult to swallow. Especially, if you are about to begin school and are looking for a lot cheaper alternative. We have investigated different options that might be available. Starting from Windows 10 laptops under $200 price, refurbished devices and of course Chromebooks. The most important factors to look for in a laptop at this price are: User-experience, storage, display and battery-life. Windows 10 is a heavy operating system but developer have done a good job cramming it into a drive as tiny as 15GB. Windows 10 always requires a whole bunch of additional programs from Microsoft Office to Chrome and all of them would require space on your storage. Considering a USB Flash Drive for extra storage is highly recommended for most of these laptops. 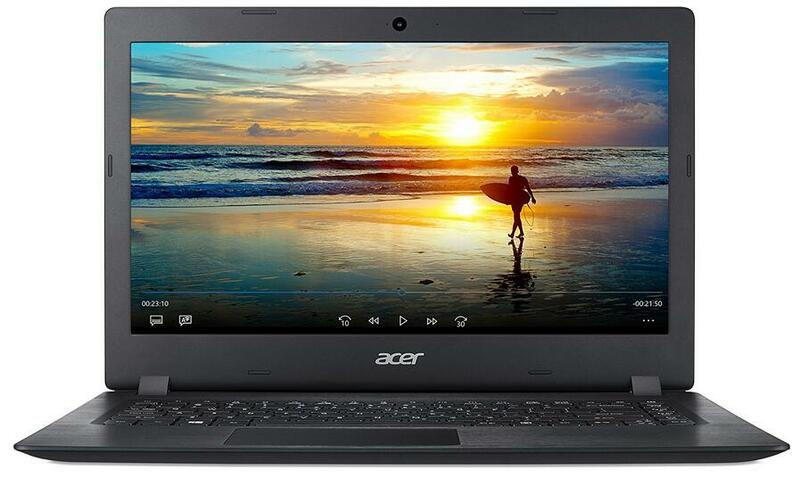 Acer has been known to provide budget-friendly laptops for quite some time and they brought out yet another laptop after partnering with Microsoft, that is the Acer Aspire 1. This laptop though in under 200$ is one among the best Windows 10 decides you can get your hands on. The screen size is 14 inches and it comes with a metal brushed finish. It is thin and lightweight, hence easy to carry around too. The 180-degree hinge makes the laptop pretty much user-friendly in terms of physical aspects and all the ports are well placed on either side. Even though the design aspects do not have anything much to fancy about, it still has all the essentials for a casual daily user. The resolution is 1920*1080 pixels with a Full HD display. The colour reproduction is good and the display is sharp and clear. The only minor drawback was the dull blacks on the screen, but apart from that, the Acer Aspire 1 packed a good punch in terms of display. The processor is an Intel Celeron N3450 Quad Core which when boosted can go up to 2.2 GHz. The RAM is of 4 GB and it can handle day to day tasks with ease. The 32 GB of onboard storage is a let-down but can be upgraded. The integrated Intel HD Graphics 500 GPU is decent when considering budget laptops but is never meant for regular gaming purposes. The WiFi the laptop houses also sports a MIMO technology. The webcam is of VGA type and offers standard clarity which is acceptable at below 200$ price point. The connectivity ports include a USB 3.0 port, an HDMI port with HDCP support, an SD card reader, 2 USB 2.0 ports and a 3.5mm audio jack. The OS inbuilt is Windows 10 and it also comes with inbuilt stereo speakers which perform moderately well. Also, the battery can last you up to 9 hours of regular usage. This laptop is an excellent buy if you are considering the price segment especially since it is under 200$. The features are worth it but some of it like the storage capacity could have been better. Apart from that with an impressive display and performance in this category, the Acer Aspire 1 is a solid buy! 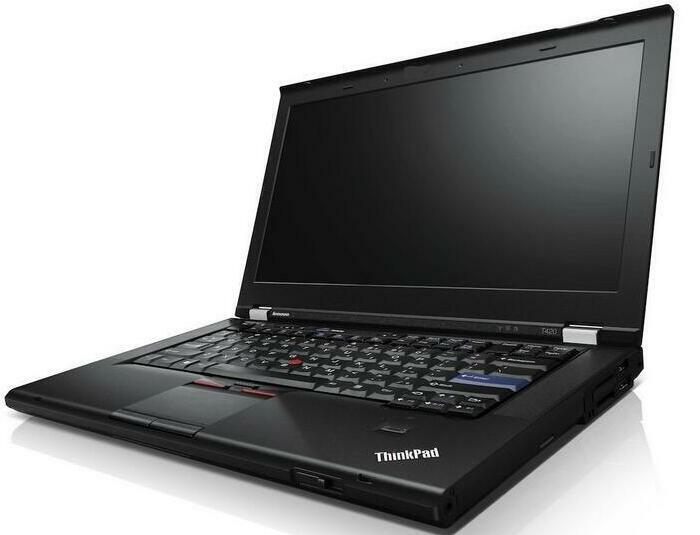 The 210s is one among the latest edition under 200$ from Lenovo. The flagship laptop from Lenovo it has all the specs you would expect from an inexpensive device, but the real question is: does it impress? The display is an 11.6-inch screen with an HD LED-backlit energy-efficient screen. The resolution of the laptop is 1366* 768 pixels. The build quality is average but is solid enough for day to day casual use. 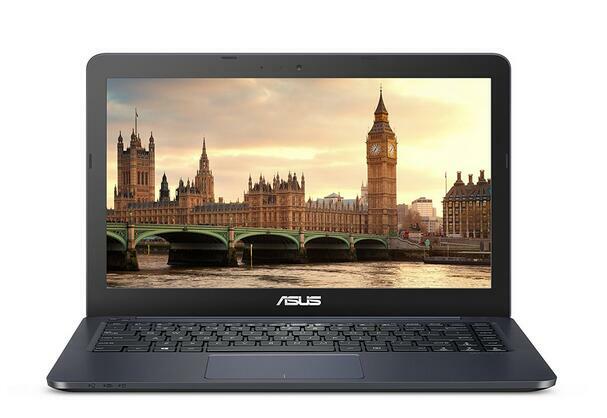 It comes with an Intel Celeron N3350 Dual Core processor which is initially 1.1 GHz but can be boosted up to 2.0 GHz. The RAM is of 2GB which is not sufficient enough to move on to higher tasks that demand more memory. The storage is the major let-down considering the laptop with a 32 GB eMMC memory. The inbuilt graphics is an Intel HD GPU 500 which is decent enough for casual tasks. It comes with stereo speakers, Bluetooth 4.0 and also an average webcam. Sadly no optical drive is present in this device. The connectivity options include a USB type-C port, 2 USB 3.0 ports and an HDMI port along with audio input jack. Now the connectivity ports included in the Ideapad 210s is a relief considering the drawbacks in other segments. It comes inbuilt with Windows 10 OS and also has a built-in media reader for transferring of photos. The laptop is just like any other average performer under the 200$ laptop category. 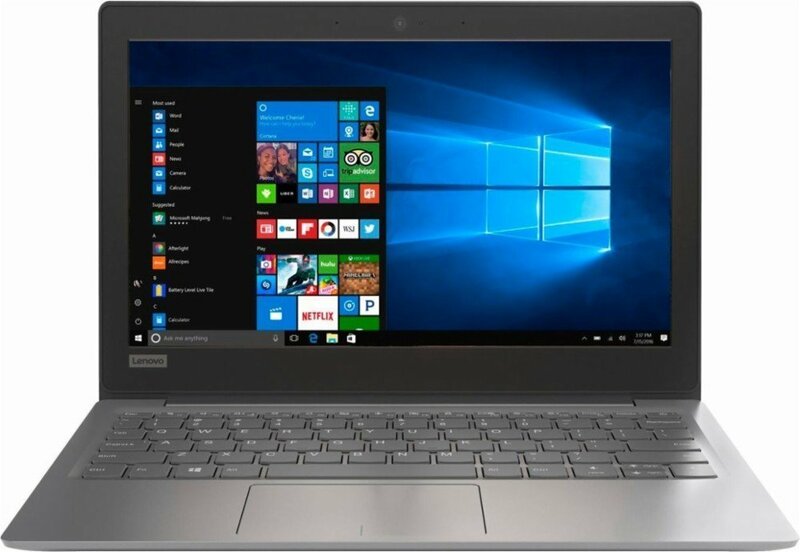 If your sole purpose is just for extreme casual usage, then this laptop can be a decent choice considering it is an Ideapad and also the fact that it is lightweight and compact. But the storage capacity, as well as the slow lagging performance, can be a nightmare at times. You would still be off with better laptops in this price point if you are not really obsessed with Ideapads or Lenovo. DELL has come up with a new version of the Inspiron which surely does tend to get the heads turning with its cool new features. But what really decides the overall performance is beyond the additional new features. Let’s get right into it. The laptop’s design is the main highlight with the convenience to use it as a laptop as well as a tablet. You can use it in another two ways too such as a tent or a stand. 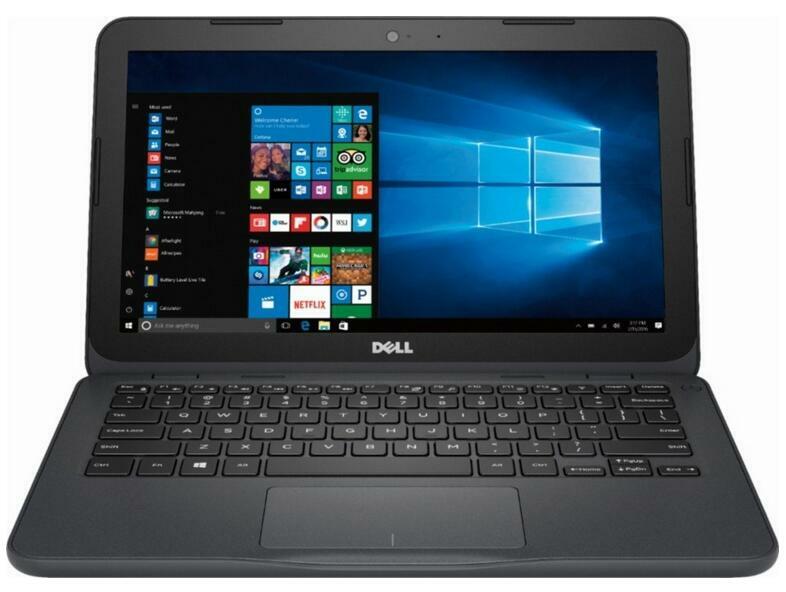 With the versatility it incorporates and also being lightweight to carry around, the 2018 DELL Inspiron does deserve a spot in best laptops under 200$. The processor it houses is an AMD A6-9220e with 2.5GHz and 4GB of DDR4 RAM. The GPU is an AMD Radeon R4. The storage even though is a fast eMMC drive, only has 32 GB capacity which can become a headache if you have a lot of files to store. The screen is of 11.6 inches with a resolution of 1366*768. The display is decent keeping in mind that it is a budget laptop. Another great add-on at this price point is the 10 finger multi-touch support. The keyboard performance is decent and gives a good response. The connectivity ports include a Micro SD card reader, Bluetooth 4.0, a USB 3.0 port and a USB 2.0 port. It also comes with Windows 10 OS pre-installed. The DELL INSPIRON 11 has all the features to impress budget laptop buyers. The processor and RAM it houses is good enough to handle most day to day activities. Gaming is not an option but higher-end tasks could still be processed decently. The physical features are impressive and do make it stand out. The best part about this laptop is the fact that it weighs only 2.6 pounds and is ultrathin too with just a thickness of 0.8 inches. Considering all this, the laptop is definitely a solid buy under the 200$ laptop category. 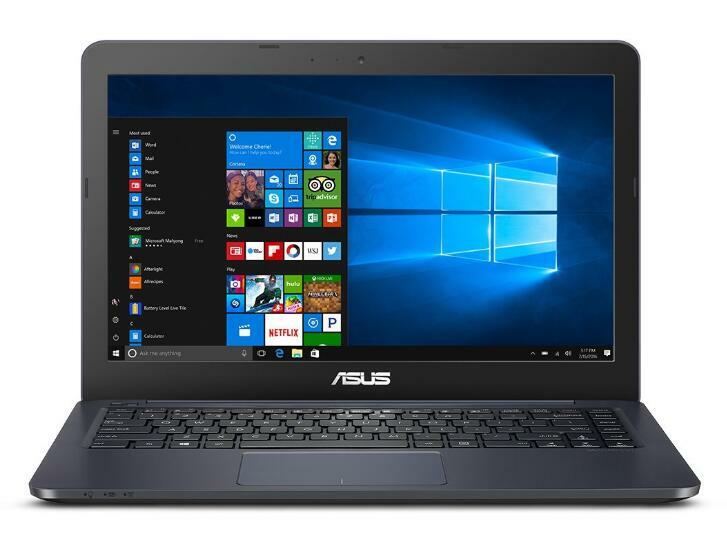 The Asus L402WA-EH21 is a budget laptop which does offer many features for the casual users out there. This laptop from Asus has all the rights to be in the top list and we are just going to find out how. Talking about the design, the build material is entirely plastic which is very much expected. Though it is plastic, this laptop does have a premium look and finish which is eye-pleasing. It is slim and lightweight too than most of its competitors making everyday commute with it easier. The connectivity options include a micro SD card reader, a USB Type-C port, a USB 3.0 port, an HDMI port, an Ethernet port and a headphone/microphone jack. When it comes to display, that’s where things go slightly out of hand as expected with budget laptops. It has a 14-inch screen with a resolution of 1366*768 pixels. The display quality is not that great and falls below the average performance even. The keyboard is sturdy and performs decently along with the trackpad. The trackpad could have been designed better but it gets the job done. The processor is just another average AMD E2-6110 at 1.5 GHz with a RAM of 4GB. The GPU is an AMD Radeon R2 graphics processor and the storage is just 32 GB of eMMC flash storage which is only ideal for college works and simple office tasks. The battery life can last up to 7 hours at the max if you are lucky enough and that too only because it comes pre-installed with the Windows 10. 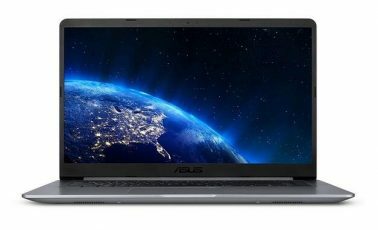 The Asus L402WA-EH21 can be one of your top priorities if you are looking at a budget laptop that is easy to commute around with. It is, of course, a solid performer when it comes to basic tasks that do not require much processing. This laptop has everything one would essentially need considering its budget though the display could have been much better. Overall, if you are looking at a solid and decent buy under 200$. You can definitely consider a green signal for this laptop from Asus. 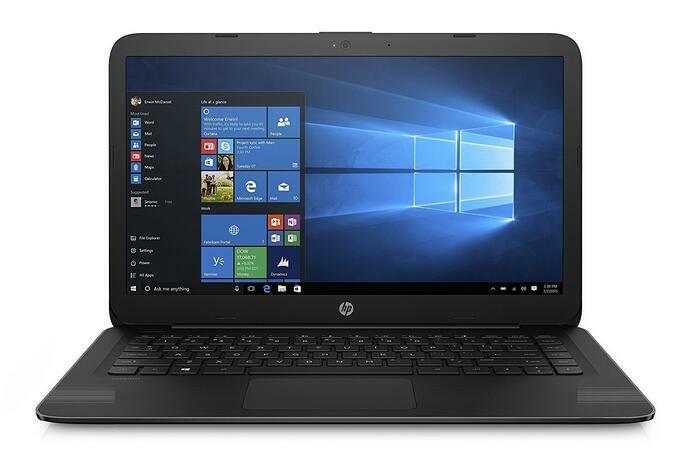 A compact looking laptop from HP that is made for giving a tight competition to Chromebooks, yes, that is the HP 14-ax040wm. The design is slim and lightweight which makes it very easy to carry around. Even though the build material is plastic, it does look premium and not like other plastic made laptops in this category. The black finish is aesthetic in all feels and definitely gives a good initial impression. The display is a 14-inch screen with a screen resolution of 1366*768. The performance regarding display was average considering the fact that the viewing angles were mediocre. The images sometimes appear washed out and thus lacks clarity. The keyboard is not backlit but that is adjustable since you are not paying so much for this laptop. The trackpad and keyboard’s performance is decent with not much of an issue. The processor it comes along with is an Intel Celeron N3060 with 4 GB of RAM. It also houses an Intel HD graphics and a storage capacity of 32GB which is an eMMC solid state drive. The storage can be an issue at times but there is an option to add storage externally when necessary. The connectivity ports include a Bluetooth 4.0, an HDMI port, a USB 2.0 port and 2 USB 3.0 ports. The battery is non-removable and gives an impressive usage time of over 9 hours which is quite great considering the price category. 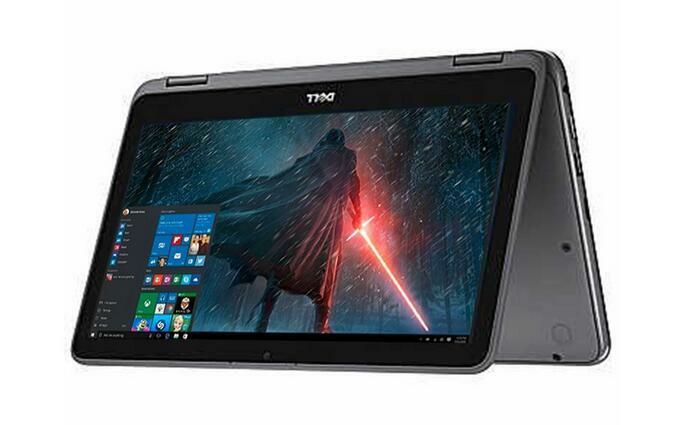 It comes bundled with Windows 10 OS and is a laptop ideal for day to day activities except for gaming. This laptop does give you more features than what you pay for and is ideal for casual users. The storage drive is pretty quick but falls a bit short on storage. But you can cope up with that using an external storage drive. The processing power of the laptop is decent but is not meant for gaming so we don’t even have to go there. The display could have been a tad bit better but nevertheless, the HP 14-ax040wm is a great solid buy and is worth the mention in the best under 200$ laptop category. 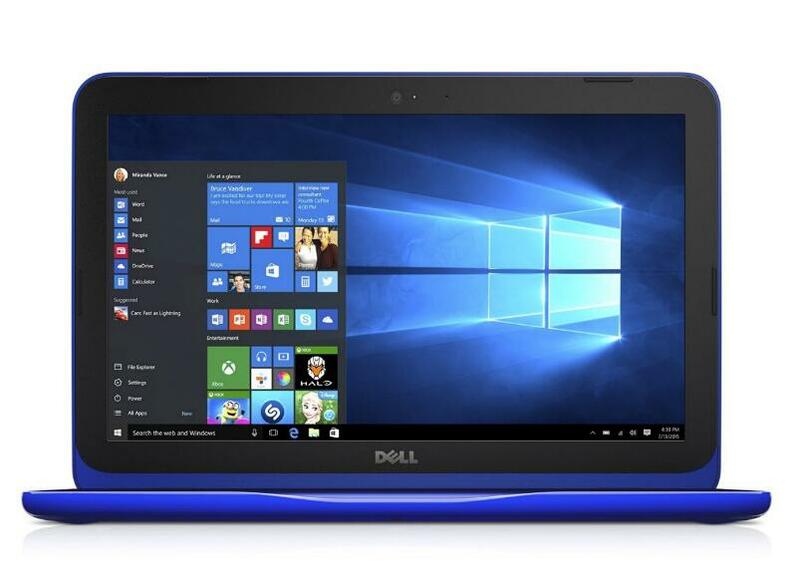 This laptop from DELL is one of the latest editions under its flagship title. The Inspiron series from DELL has always managed to give a decent performance. But coming to the flagship in the budget category, does it have what it takes? The build quality is decent though is made of plastic. It does not look cheap and is good enough for everyday use. The screen size is of 11.6 inches with a resolution of 1366*768. The display is of decent quality with the laptop having an anti-glare finish to help reduce eye-strain. This is a good feature incorporated in terms of display. The display screen also has an energy-efficient LED backlight. The OS it houses is Windows 10 with additional features such as Edge web browser. The processor is an AMD A6-9220e with 4GB of RAM. It also has an AMD A6 APU which can handle all the basic graphics needs quite well without much of an issue. The storage space is 32 GB and is managed by the eMMC flash storage. This calls for high definition video playbacks and also very short boot up times. The connectivity ports include a USB 2.0 port, a USB 3.0 port, an HDMI port, an Ethernet port and also a headphone/audio jack. The drawback is that this laptop lacks an optical CD/DVD drive so you might want to get an external one for yourself. The 2018 DELL INSPIRON FLAGSHIP has a decent display and processor when compared to other budget laptops under 200$. Though it is not meant for gaming purposes, this laptop makes a good choice for day to day activities and multi-tasking. Considering the overall aspects, it does quite fit well in the best laptops under 200$ list! 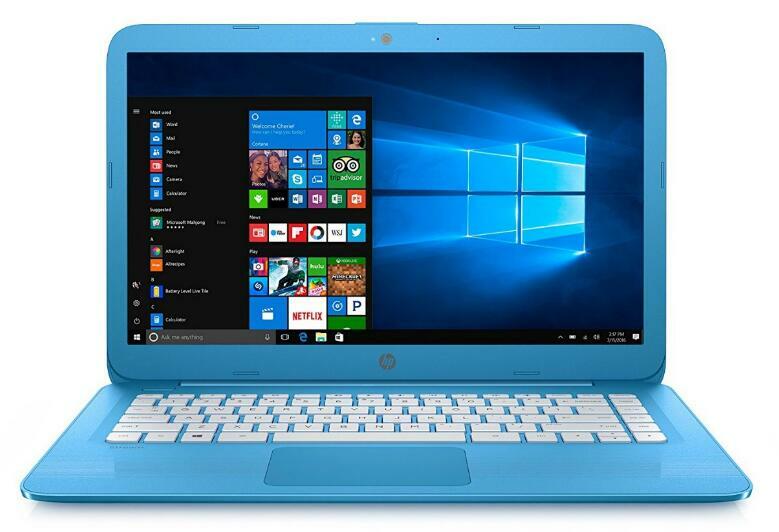 The HP Stream series is probably the most popular laptop on our list. The striking blue or violet-purple colour, whichever one you prefer, is definitely going to draw a lot of attention. Apart from that, the next thing to notice about this laptop is how light it weighs. The 14” model weighs 3.2lbs or 1.5kg and the 11” model weighs even less. The build quality is not the greatest but it is robust enough for you to carry around carelessly throughout your campus or office. Looking inside, you will find a dual-core Intel Celeron N3060 clocked at 1.6GHz with a burst which can go up to 2.8GHz. Celerons don’t have the turbo-boost technology. They only show a burst in their clock-speed when there’s too many jobs for the processor to do, unlike turbo-boost which is long-lived quite stable. The specs are identical to IdeaPad110 that we saw previously. HP Stream has an eMMC storage of about 32GB out of which about half will be taken up by the Windows 10. The 14 inch model has an SD card reader, 2 USB 3.1 gen1 ports and 1 USB 2.0 port. The 11 inch model has a microSD slot instead and 1 USB 3.1 port and 1 USB 2.0. We also have wireless 802.11 AC but no Ethernet port. The battery can last from 6 to 8 hours. The 11 inch model is my personal favourite, it has an anti-glare coating on it and also the lower resolution is much more tolerable with smaller displays. The 11 inch model is priced at $207 and the 14 inch is at $210. As an added bonus, the HP stream comes with a one year of free subscription of Office 365 showing HP’s confidence in this product. A competitor to the HP Stream is the L402SA from Asus. We will get into the differences but first let us cover the basics. The CPU is a Celeron dual core clocked at 1.6GHz with 2M of cache. The RAM is the usual 4GB and for storage we have 32GB of flash storage. It comes in 14” and an 11.6” model. Both have the same 1366 by 768 resolution. The design and aesthetics are simple and professional. The build quality feels robust. You won’t feel like procrastinating on your next assignment because typing and document editing is super-comfortable on this laptop. To make matters even, it also has a one year free subscription to Microsoft Office 365 and a 100GB of One Drive cloud storage. For peripherals we have 1 USB 3.0, 1 USB 2.0, HDMI and an Ethernet port and a VGA port which is handy for giving presentations on older projectors. The 14” model weighs 3.6lbs or 1.6kg which is slightly heavier than the HP stream but it does provide a little extra stability while using the device. Also it is $10 cheaper at $200 on Amazon. All in all, this is a good purchase for bloggers and college students. Light-weight browsing, checking your emails, streaming Netflix or YouTube and writing articles for hours without charging is the real selling point of this laptop. This is also a good device for your kids to introduce them to the technological world. The Dell Inspiron i3162 is suspiciously cheap at only $150. 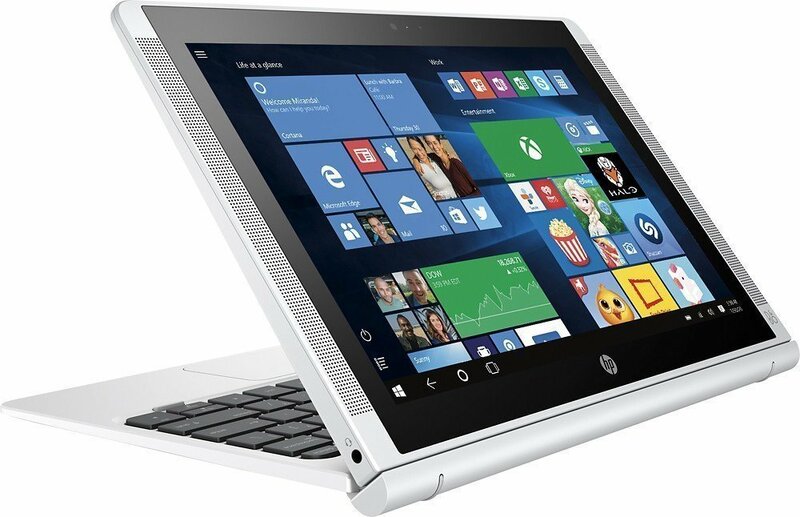 The specs however are identical to those of HP Stream and Asus L402SA. The places where it falls short are the free Microsoft Office 365 subscription and the 14 inch screen option. These are not major drawbacks, mind you. The specs are nothing extraordinary, Intel Celeron N3060 seems to be every manufacturer’s choice for budget devices and a 4GB of DDR3 RAM provides decent specification at $200. The storage is again a 32GB eMMC storage which is neither to large nor too fast but can get the job done. The body is made up of hard plastic and has several options in color, blue being the most popular. The build quality isn’t great, the screen flexes a lot under pressure and the glossy exterior is an annoying finger print magnet. The keyboard is quite impressive for a $150 laptop. The keys are spaced apart to keep the inaccuracies to a minimum. Also the arrow keys are similar to that of a typical full-sized keyboard which is nice. The display is a 1366 by 768, 11” TN panel with poor color reproduction and viewing angles. However, it does have an antiglare coating on it to make the outdoor usage friendlier to your eyes. For connectivity, we have a good few options, starting from 802.11 ac and Bluetooth 4.0 for , an HDMI port, 2 USB 2.0 port and 1 USB 3.0 port. There’s also a microSD slot, but unfortunately no Ethernet port. If you don’t mind the lack of free Microsoft subscription and a smaller screen, this is really a better option as it is super light at 2.8lbs or 1.2kg and still manages to give almost 6 to 7 hours of battery backup. The monotony of your Celerons and typical laptop form factor is broken by this nifty little 10.1” device. The Pavilion x2 is a convertible laptop. It has some compromises made in terms of weaker processor and just 2GB of RAM which makes recommending it difficult for us. The device can be used in two modes. The first mode is where it is your typical laptop with full Windows 10 Home experience with a keyboard and mouse or touchpad. The second mode is the tablet one where the screen snaps off and Windows goes to tablet mode. The screen hinges are magnetic and wouldn’t wear off easily. For connectivity HP has provided 1 USB 3.0 another single 2.0, a micro HDMI port and a microSD slot. All of these are on the detachable screen so you don’t have to worry about bringing along the keyboard for additional connectivity. The wireless is 802.11 ac in case you are wondering. The display is an IPS panel with an odd resolution of 1280 by 800 which is designed to strike a balance between the tablet mode and the notebook mode. It supports a full 10 finger touch but the fingerprints on the display can get annoying at times. HP claims that the battery can last up to 9.5 hours but realistically you can expect it to last somewhere between 8 to 9 hours, which is still quite impressive. 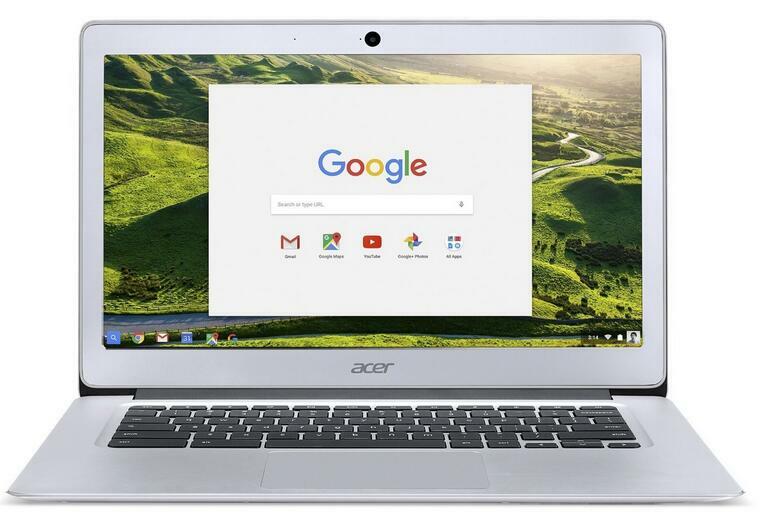 Google is trying to expand into the notebook market ever since it came with its Chrome browser. Most computers, regardless of Operating System, are running Chrome to browse the Internet. Seeing that the budget laptops are used mostly for browsing the Internet and streaming videos, the Chrome OS is something you can consider. Google developed Chrome OS as something which is supposed to be always on the Internet. If Internet connectivity is an issue for you, you might not want to consider this. Document editing is not big deal with Google Docs catching up with MS Office. Also MS office does have an online version to use in your browser. That said, it does have some perks over Windows 10. First, Chrome OS is meant for low spec devices. It consumes less energy, it can run off of weaker processors and it need very little space on you storage. Making it a worthy contender on the budget notebook range. Let’s dive in and look at some of the Chromebooks in a greater detail. 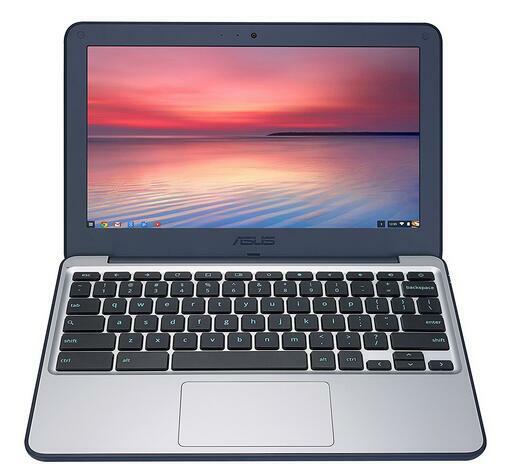 With an Intel Celeron N3060, 16 GB of eMMC storage and 4GB of RAM the Asus C202SA is your typical low end Chromebook. The storage may seem less but it is comparable to the 32GB Windows 10 notebooks in which the OS itself takes up to 16GB of storage. The Chrome OS is lighter and you get ample storage left for your files and programs. The laptop looks thick and bulky for a very good reason. It is targeted towards young students and is thus reinforced with a rugged rubber coating. The robust design also allows you to open the lid to a full 180 degrees. Damaging the device or getting hurt by it is unlikely because of the lack of sharp edges. It is lightweight at only 2.2 pounds or 1kg. This can survive a rough life and can be carried around in a backpack carelessly. The battery life is around 9 to 10 hours which can easily last an entire school or college day. You get an additional 100GB of Google Drive file storage which is valid for two years. Needless to say, this means an additional dependence on your Internet connection to access your personal files. The display is an 11.6” 1366 by 768 TN panel and although it is nothing special, it can get the basic jobs done on it. For children who are curious to learn, one can’t recommend this device enough. It also has an antiglare coating on the display encouraging outdoor usage. Asus has advertised this to be completely serviceable so you don’t have to worry about replacing the entire laptop if something breaks. Of course, for a device which depends upon the Internet, it needs the fastest available Wireless technology and so we see 802.11ac available in it. It also has 2 USB 3.0 ports, an HDMI port and SD slot providing plenty of connectivity options for you. The keyboard has a standard layout without the numeric pad, but it does provide a good enough key travel for an enjoyable typing experience. The price is $200 and you will not necessarily need to expand your storage, so that is all you will be paying. This 11.6” chromebook is the third iteration of Samsung’s record-breaking chromebook that came out first in 2012. 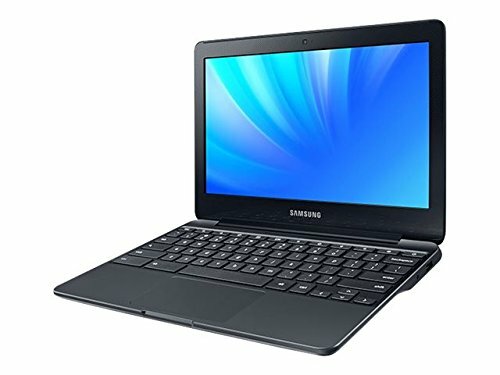 This device is just as user-friendly and well designed as the previous generation of the Samsung chromebook. The newer Celeron N3050 chip is a little slower at 1.6GHz but the Chrome OS can still run smoothly on it. For storage you get a16GB eMMC drive and a 4GB of DDR3L main memory. The keyboard is spill-resistant and typing experience is mediocre. Unlike Asus, Samsung has made their device look much more sleek and premium rather than providing a ton of rubbery protection. It weighs 2.5 pounds or 1.13kg, adding little to no bulk to your backpack. The battery life is also quite impressive around 8 to10 hours depending upon the type of workload. It has the usual 802.11 ac wireless and Bluetooth 4.0 for wireless connectivity and 1 USB 3.0 and 1 USB 2.0 and a display port for peripherals. Typing, editing and web browsing is easy, even outdoors, with the antiglare coating on the 1366 by 768 display. Again, this display may look meagre but on an 11.6” screen it is not going to hamper the sharpness of the image a lot. All in all, a good and compact device for $180 which is a little more than the Asus. Getting out of the 1366 by 768 resolution would require us to stretch our budget. The 1080p laptop from HP is the first 1080p chromebook on this list. 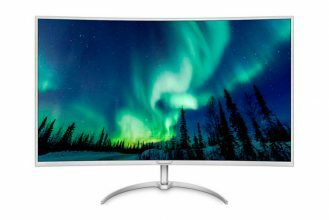 For a $250 price tag you get a 1920 by 1080 high resolution display. Powered by a quad-core Celeron N2940 at 1.85GHz and 4GB of RAM, this chromebook does it all at a high resolution and at greater speeds. The local storage is only 16GB and is a bit slower but you also get an additional 100GB on the Google Drive like most chromebooks, for 2 years. The user experience is way too premium for what it is worth. The design is sleek and very professional. Giving a professional presentation will not be an embarrassment if you use this instead of a bulky gaming laptop with RGB all over it. It comes in two colours blue and silver. Battery life is about 6 to 8 hours of casual usage and that too with a 1080p screen is an impressive deal. The weight of this device is 3.75lbs or 1.7kg and it comes with all your typical connectivity support which includes 802.11 ac, 2 USB 2.0 and a USB 3.0. It is about $70 more than the other chromebooks we have seen so far, but if you can afford it, it is a great bang for the buck. The refurbished electronics is a scary market for consumers. You are already stretched thin on the budget but you want something with decent specs. At the same time, if you mess up and buy something broken then you are worse off than when you began. Fortunately, there are reliable sellers for refurbished laptops who can make sure that you don’t get conned. When a technical professional spends time and resources in fixing a device that is going to show up on the price tag too. So the line between being economical and reliable is very hard to navigate. To make matters easier for you, we have looked at two most promising laptops on Amazon sold after being professionally restored to their original working condition. This device shows us the fact that new doesn’t mean better. It is a decent performer with an i5-2520m processor clocked at 2.50GHz which can turbo-boost up to 3.2GHz, it has 2-cores/4-threads with hyper-threading and also 3M of cache. There plenty of room for your applications to run, with 8GB of RAM. If raw specifications are all that you care about, then this laptop is the obvious choice. At $250, you’d be hard pressed to find a better alternative. For storage we have a 320GB HDD and it comes with Windows 10 preinstalled in it. The device weighs 4.5lbs and is quite bulky to carry around. Also the battery can hardly last 4 to 5 hours of continuous use which gets reduced further if you use it for heavier workloads. Being an older device the peripherals are also out-dated. You will find an optical drive, a VGA port, an HDMI and a couple of USB 2.0 ports in this. Also included are an Ethernet port and Wi-Fi 802.11 bgn. The user experience is pretty decent, once you get used to all the hotkeys spread around the standard keyboard layout, this device can really boost your productivity. The display is at an odd resolution of 1600 by 900 but it does have an antiglare coating on it. For shear computational performance, this device is an obvious choice. However, if you want something which is much more pleasing to the eyes you may want to check out our last device on the list. The Acer’s chromebook is really worthy of its flagship title. It has a Celeron N3160 clocked at 1.6GHz which is good enough to manage most of your daily productivity tasks like presentations, word editing or browsing heavy webpage. Furthermore, it has 4GB of RAM and 32GB of storage which is more than enough for all the typical documents and photo collections of an individual. You can also edit MS Office documents using an online version of MS office tools. It has 802.11 ac, an SD card slot, HDMI port and 2 USB ports on it to connect to your peripherals and the Internet. 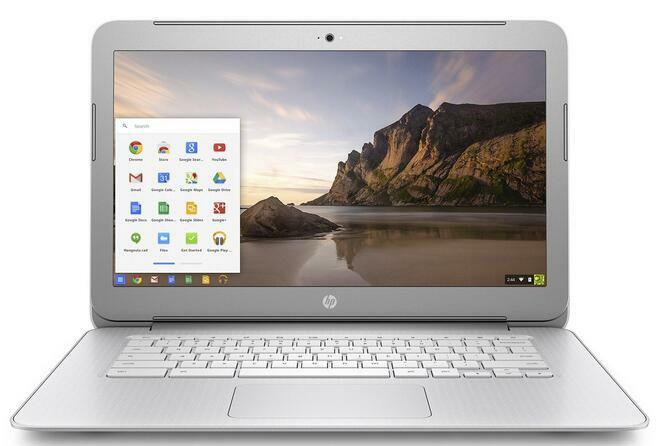 The real attraction of this chromebook is its 14 inch, 1920 by 1080 resolution IPS display which can entertain you for about 7 hours without the need for charging. It weighs 3.45lbs which is alright for a laptop of this size. Needless to say, being a flagship it has an excellent build quality and looks and feels premium to use. The sleek design and lightweight would be hard to get at $230 but thanks to refurbished products on Amazon, you can get one. To paraphrase Steve Jobs, we often misinterpret abundance as availability of many good options. More often than not, this is not the case. Before making a purchase, just ask yourself what your individual needs are and then use our reviews to find the one best suited for your job. Need Windows 10? Forget about the Chromebooks. Don’t want to stress your eyes get a higher resolution display at 14 inch size. Honestly evaluate your needs and then make an informed unbiased decision about what to get.